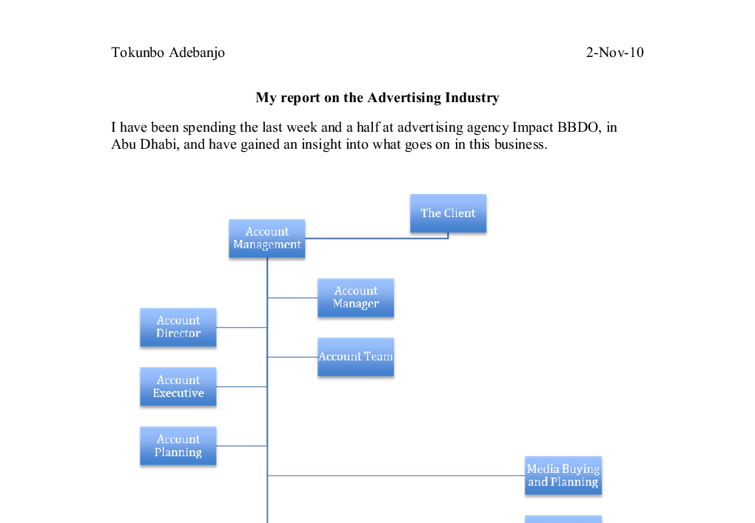 My report on the Advertising Industry. I have been spending the last week and a half at advertising agency Impact BBDO, in Abu Dhabi, and have gained an insight into what goes on in this business. My report on the Advertising Industry I have been spending the last week and a half at advertising agency Impact BBDO, in Abu Dhabi, and have gained an insight into what goes on in this business. 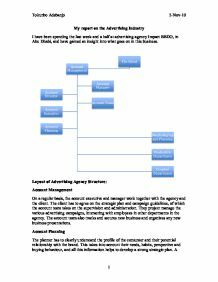 Layout of Advertising Agency Structure: Account Management On a regular basis, the account executive and manager work together with the agency and the client. The client has to agree on the strategic plan and campaign guidelines, of which the account team takes on the supervision and administration. They project manage the various advertising campaigns, interacting with employees in other departments in the agency. The account team also tracks and secures new business and organizes any new business presentations. Account Planning The planner has to clearly understand the profile of the consumer and their potential relationship with the brand. This takes into account their needs, habits, perspective and buying behaviour, and all this information helps to develop a strong strategic plan. A variety of forms of qualitative market research is done, which includes interviews and focus groups. ...read more. The production manager often needs to use outside help, such as TV production companies and poster print specialists, so it's important they find the right people needed at the right cost. Sometimes the clients have a list of approved suppliers they'd like to work with, so this must be taken into account by the production team. Working in this department is very high pressure, as various deadlines need to be met and everybody must be working up to speed in order to avoid delays and inconveniences. Roles within the Advertising Agency * Managing Director * Copy Writer * Art Director * Creative Director * Creative Group Head * Creative Consultant * Graphic Designer * Production Manager * Studio and Production Executive * Chief Accountant * Account Manager * Account Executive * Account Director * Accountant * Proof Reader * Finalizer * Public Relations Officer * Personal Assistant * Receptionist * Trainee * Office boy Various media used for advertising * Posters * Newspapers * Magazines * Television * Cinema * Radio * Direct mail * Online * Ambient media Mock Creative Brief for Oxford Notebooks ...read more. 9. What would we prefer they think, feel and do? To channel all this energy into writing in a good quality notebook, and treasure their memories, both good and bad, for many years to come. 10. How do we bridge the gap? Letting the target audience know exactly how the company's products can relate to them. 11. What is the tone of the communication? Suitable language for the young people (target audience) that they can understand and engage in. 12. Describe the competitive environment? Companies with popular notebooks at the moment are Laura Ashley, Cath Kidston, etc. They all rely on garish cover designs, whilst Oxford Notebooks has more to offer, in a different way. 13. How will the communication be measured? 14. Mandatories: Where could I fit into the Advertising Industry? I am a creative person, and I am very interested in many various aspects of the arts, my strengths being in writing and fine art, as well as some computer graphic design. The roles in an advertising agency that would most appeal to me are copywriter, art director and graphic designer. ?? ?? ?? ?? Tokunbo Adebanjo 2-Nov-10 1 ...read more. "Confidence of tomorrow's day - NSP "SOUTH"." Each kind of advertising carries out both functions of advertising, but everyone has the different purposes. So informative and safe advertising carries out mainly the first function as it is aimed first of all at transferring the information. With this in mind the other two charity slogans are addressed in a better way, as they are clear and noticeable. With the lack of persuasive text the audience will feel that this charity are not in desperate need for the donations, whereas the other charities have made the reader emotionally involves using persuasive language. The executional style could either be serious or funny. The Filipino brand of humor, besides, often comes into the picture and distinguishes it from other ads. Filipino-oriented ad, therefore, tries to communicate with the Filipino market in terms of what the Filipino market needs, believes in or what it thinks is valid. The daily newspaper "Oslo bodhenie" from Sarajevo on the other hand asks for 10.000 billboards to hang them all around town, which Benetton delivers immediately. Again in 1999�s campaign Toscani provokes the audience by showing faces of prisoners who have been judged to death. Although females and males are still not equal, the differences between gender are not so vast anymore. Nevertheless, many social institutions, such as mass media, still use gender stereotypes, basing on the assumption, that they are well known to everyone and help the receivers to understand the content of the message.